This contemporary stainless steel stovetop pot is finished in copper giving a stunning look in any kitchen. It has a magnetic base so it is suitable for all hobs including induction. 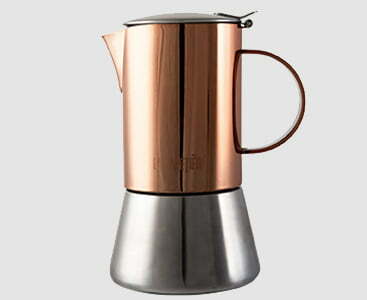 This modern take on the classic stove top espresso maker has been extremely popular amongst customers. The polished copper finish paired with silver base creates a stylish look and unique design that is like no other on the market. Invest in this product for your kitchen to improve the quality of your coffee brewing and to add a style statement. Impress friends and family and host coffee mornings as this espresso maker will brew up to 4 cups. How do I use a stove top espresso maker to brew coffee? Firstly, put your fresh water into boil in a kettle or pan. Detach the bottom chamber and remove the basket shaped coffee funnel. Fill the bottom chamber with your hot water to the level of the small valve. Put your fresh coffee into the funnel and level out the surface of the grinds. Place this funnel back into the bottom chamber and reattach this to the espresso maker. Open the lid and put the espresso maker on a low heat. The coffee should start to trickle through. If it pushes through, turn down the heat a little. If hardly any is coming out, try turning the heat up. Take the espresso maker off the hob just before it starts to bubble. This is to avoid giving your coffee a bitter taste. What are the benefits of using a stove top espresso maker? Brew your coffee in true Italian style with this traditional method. If you enjoy a rich, dark and deep coffee, this is the perfect method for you. Brewing with a stove top espresso maker brings out the many flavours of the coffee and allows you to truly appreciate the complexity. La’Cafetiere are always combining classic products with modern design to bring innovative and must-have products to the coffee market. They use high quality materials to produce products we can rely on for our brewing, and this copper finish espresso maker is no exception. The premium stainless steel makes this product strong, sturdy and resilient. The heat resistant handle and knob ensures maximum safety and will prevent your hand from burning when handling. The silicone gasket that sits inside will withstand high temperatures and maintain its shape and high quality.